1. 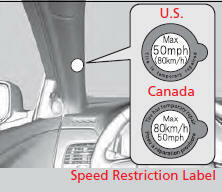 Apply the speed restriction label to the location as shown. 2. Drive the vehicle for about 10 minutes. - Do not exceed 50 mph (80 km/h). 4. 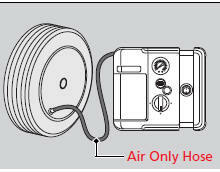 Recheck the air pressure using the air only hose on the compressor. 5. Turn the selector switch to AIR ONLY. - Do not turn the air compressor on to check the pressure. • Less than 19 psi (130 kPa): Do not add air or continue driving. The leak is too severe. Call for help and have your vehicle towed. • Front:35 psi (240 kPa)/rear:33 psi (230 kPa) or more: Continue driving for another 10 minutes or until you reach the nearest service station. - If the air pressure does not go down after the 10 minute driving, you do not need to check the pressure any more. • Greater than 19 psi (130 kPa), but less than 32 psi (220 kPa): Turn the air compressor on to inflate the tire until the tire pressure reaches 32 psi (220 kPa). • Greater than 19 psi (130 kPa), but less than front:35 psi (240 kPa)/rear:33 psi (230 kPa): Turn the air compressor on to inflate the tire until the tire pressure reaches front:35 psi (240 kPa)/rear:33 psi (230 kPa). Then drive carefully for 10 more minutes or until you reach the nearest service station. - You should repeat this procedure as long as the air pressure is within this range. 7. Repackage and properly stow the kit.